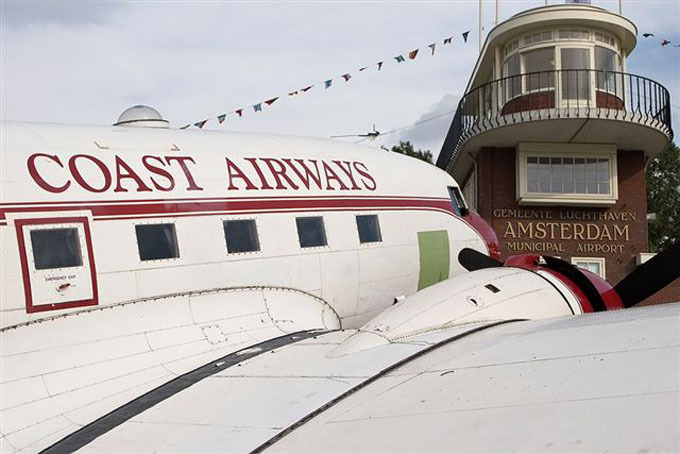 Well, it was not to be: during 2002 DDA's DC-3s were grounded (sponsor flights were being carried out by Fokker 50s of KLM Cityhopper) and South Coast Airways threw in the towel! 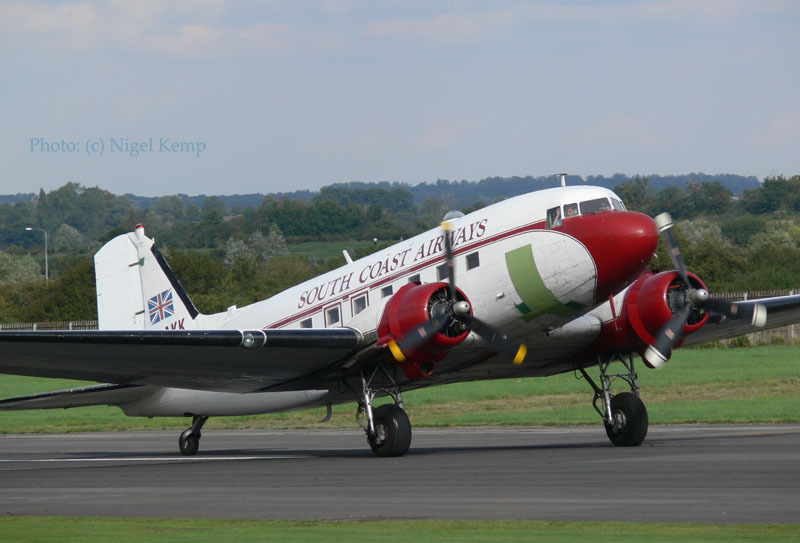 What a dismal year for DC-3s in Europe ! This C-47A Skytrain was delivered to the USAAF in 1943 as 42-23936 (cn9798) and did service in Oran, N.Africa with the 8th AF. In 1946 it found itself in Czechoslovakia and flew with CSA as OK-WDU (1947). It joined forces with the French Aeronavale in 1958 as 23936. Bought by Stellair (F-GEOM) in 1983 it started its commercial career as a freighter. It was registered to South Coast Airlines in 1994 and has since been used to fly passengers on scenic flights as G-DAKK. While the summer of 2002 seemed to progress normally for South Coast Airways (after un irregular spell of cancelled flights in May) with flights to Caen to commemorate D-day in June and sight-seeing flights from Biggin Hill that same month, it came as a shock when at noon on Thursday July 11th 2002 the airline suddenly ceased trading. 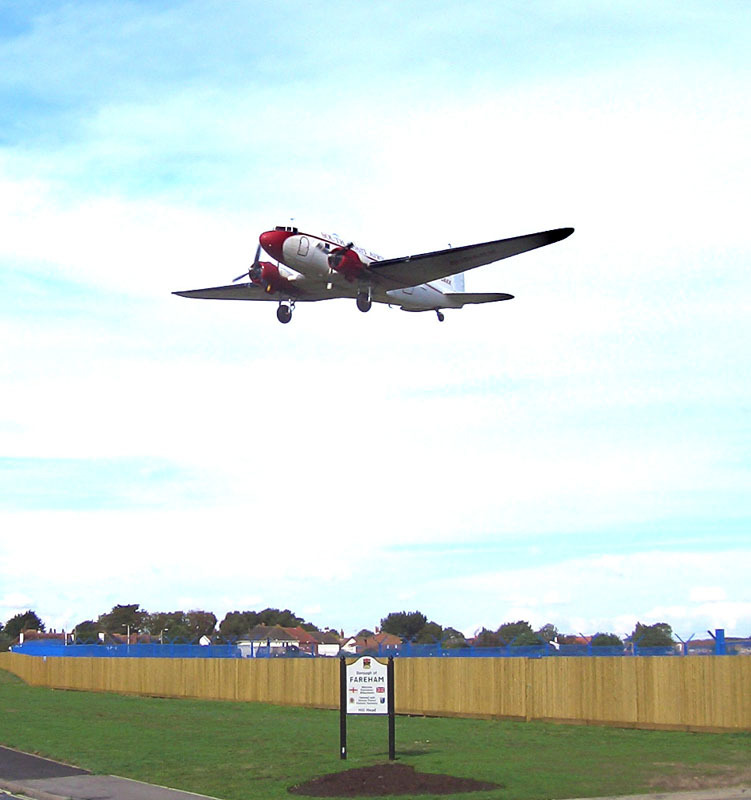 On Saturday July 13rd G-DAKK made an unexpected flight of only 20 minutes to nearby Popham Airfield, near Basingstoke. 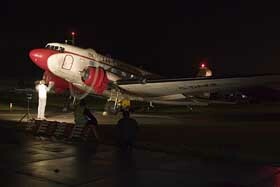 The DC-3 was parked on a quiet part of the airfield and has been offered for sale together with N47FK (cn 9700), which had been making the trips to air shows together with G-DAKK. 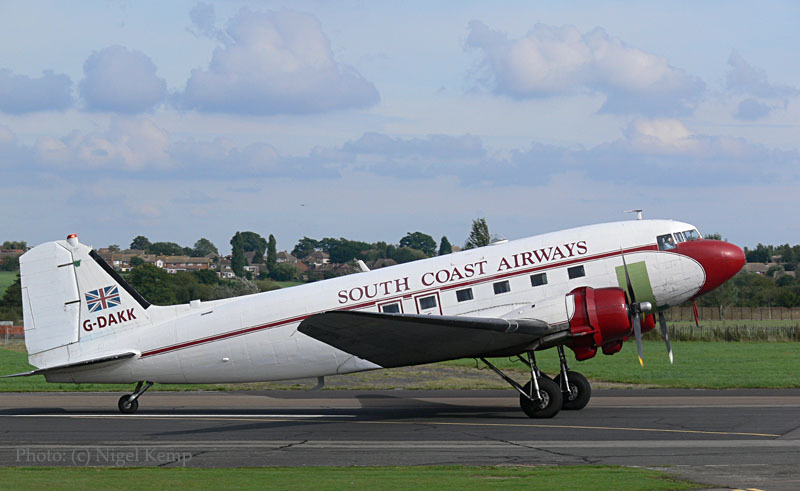 In 2000 South Coast Aws had been bought by Tony Holden of the Dakota Trust (owner of N47FK). 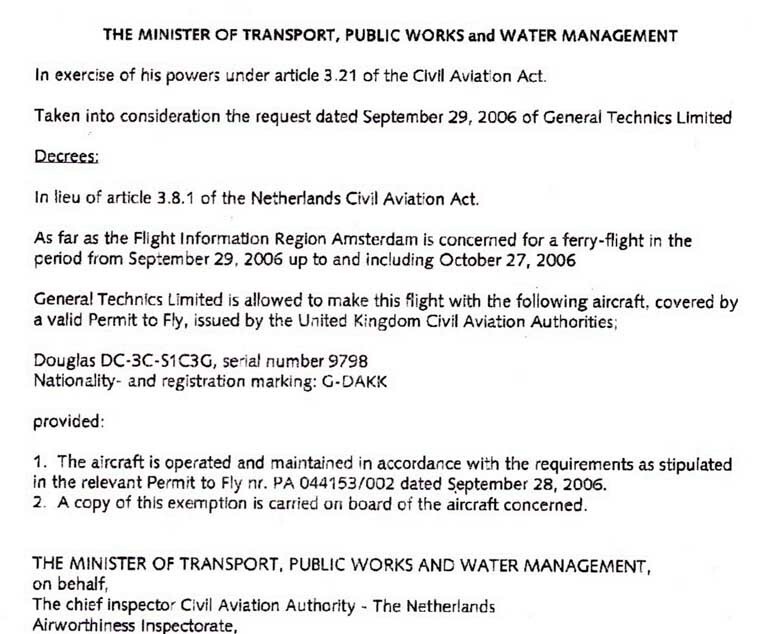 On Jan.29th 2002 the ownership of G-DAKK changed to General Technics Ltd, but an email of mine for details was dealt with a non-committing:"...the operator will remain South Coast Airways". Clearly, it was not enough to solve whatever problems existed. 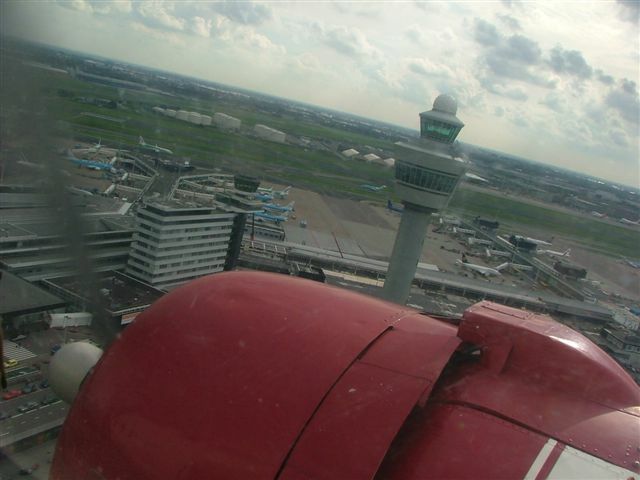 I hope for better times, for both crew and aircraft. Source: The internet, my own database and No.91 (2002) issue of Propliner magazine. Tony Holden brought me great joy when he emailed me 26Sep06 and showed G-DAKK airborne again! 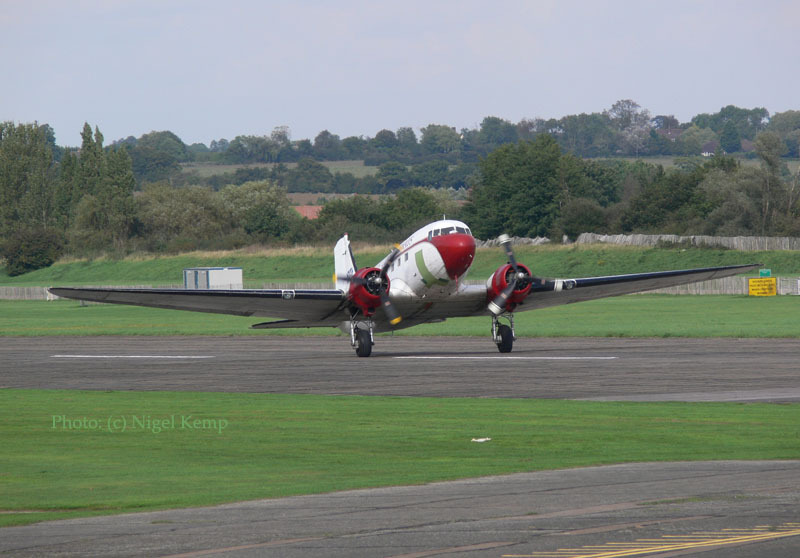 He included the following photo and information: "G-DAKK airborne at last out of Lee-on-Solent -Sunday 24Sep06- heading for North Weald for a week or 10 days, awaiting Dutch ferry permit." So it's heading my way, great! 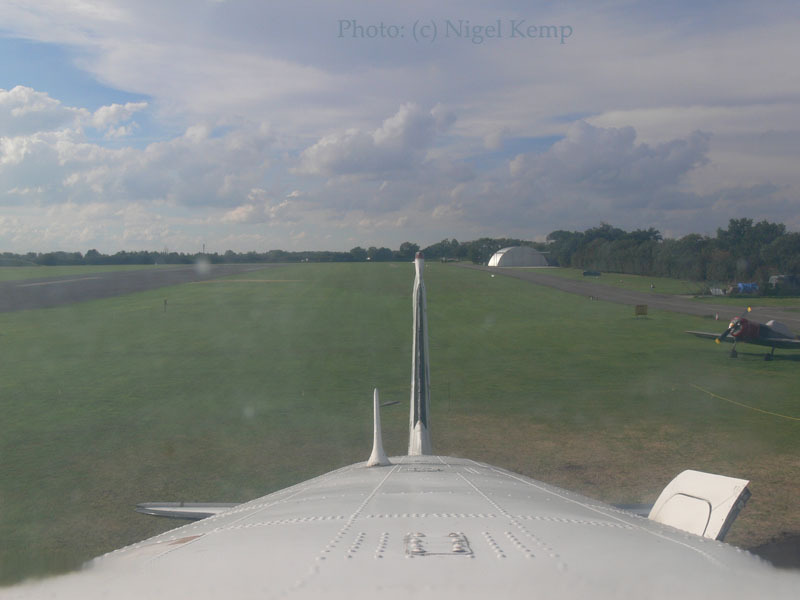 Nigel wrote: "I was working at North Weald when G-DAKK arrived,(last Sunday 24Sep2006) and was able to take some photo's of her as she landed, taxing in and once shut down took some photo`s inside." 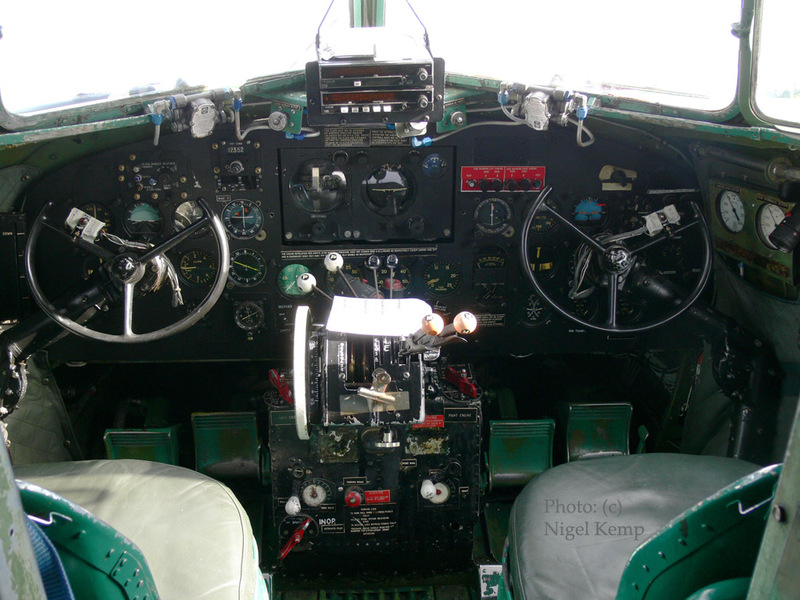 "My work at North Weald is refuelling all visiting and based aircraft on event days. 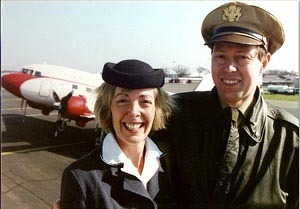 I also help out at other fly-in's, airshows and exhibition's with marshalling duties." "During what spare time I have left, I am co-ordinating editor of the Stansted Branch of Air-Britain monthly magazine." Photos: copyright Nigel Kemp (Stansted Air-Britain) -published with permission-. 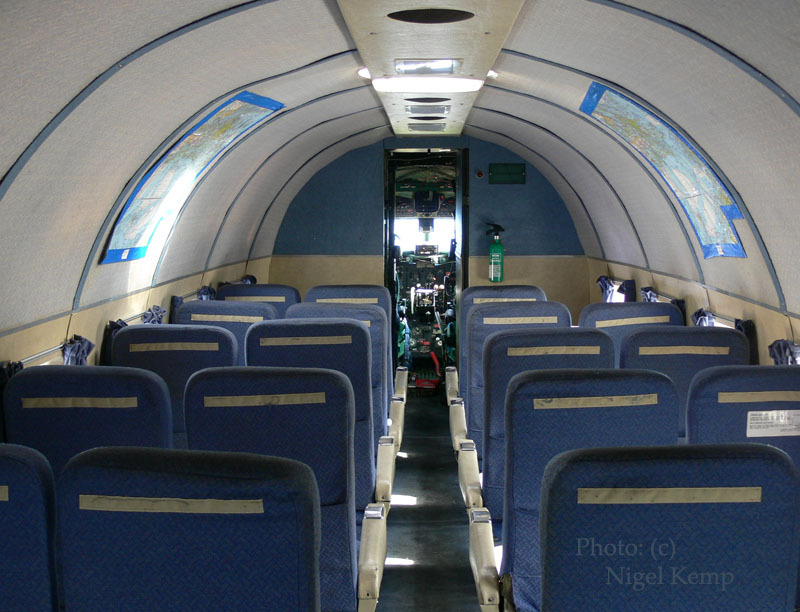 See how G-DAKK looked, still at the Aviodrome, on 30Aug09. 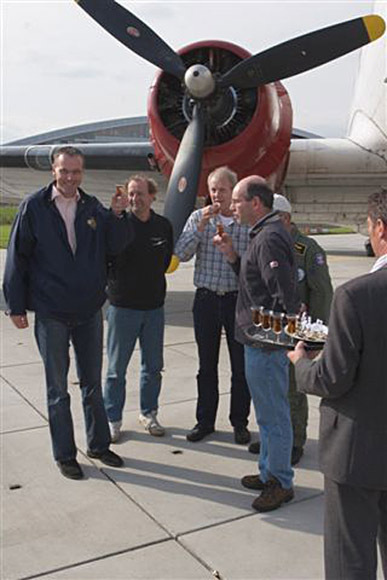 During 2013 Rob de Man, of ClassicWings.nl, acquired G-DAKK. 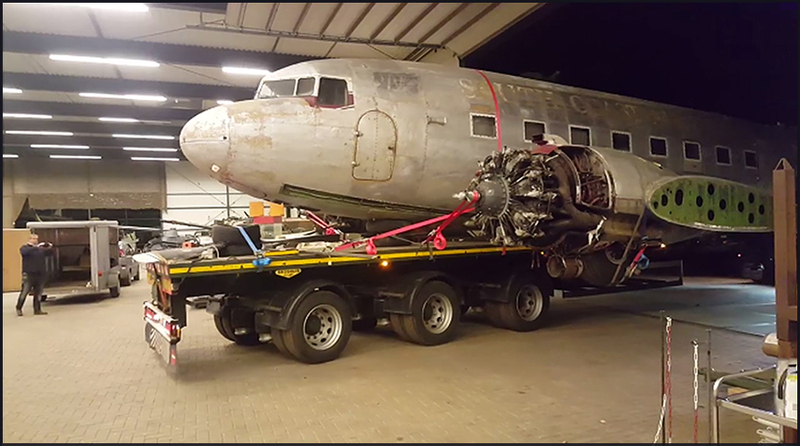 In november he had its paint stripped at Lelystad, and subsequently the fuselage and engines were transported to Weeze Airport (Germany) while the wings and parts of the tail assembly were taken to Teuge airport (Netherlands), home of Classic Wings. 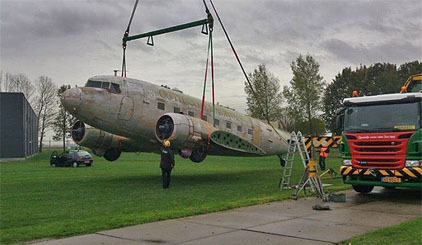 G-DAKK, partly disassembled at Lelystad for transport & restoration. Photo by Rob de Man, shared on his Facebook page. When visiting the museum one can see the progress made. Notice the South Coast-titles reappearing! Rob de Man gave up on this immense restoration project and handed it to 'Oorlogmuseum Overloon'.